The skills that OFWs acquire and master abroad can be used when starting up their own businesses. A former waiter on a cruise ship shares his success story as an entrepreneur. <>Many of the skills that make overseas Filipino workers attractive to employers abroad also lend well to the OFWs becoming entrepreneurs themselves. 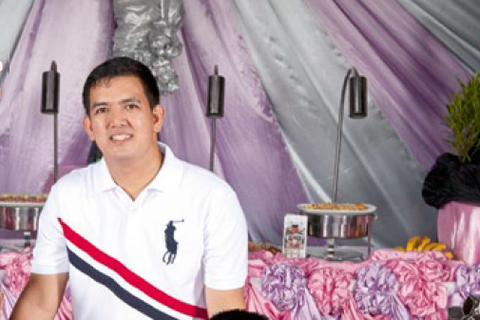 Such is the case of Ronald and Lisa Torres, owners of TNJ Catering Services based in Sta. Maria, Bulacan. Ronald, 40, spent 15 years working in the food and beverage service of an international cruise ship, but felt the need to become his own boss as time passed. So the seaman set aside P50,000 and asked his wife Lisa, 36 and an HRM and Nutrition graduate, to start a home-based food business with it while he kept working in the high seas. With the help of her mother, Nene Joaquin (hence the acronym in the business name, representing the owners’ families), Lisa opened TNJ for business on December 28, 2002. Their first job was catering for an aunt of Lisa’s who celebrated her 50th birthday, with Aling Nene doing most of the cooking. They spent most of their capital on plates, spoons and forks, utensils, tablecloths and other equipment fit for a 100-guest party, and added more as their earnings allowed. Ten years later, the business has assets of over P3 million and caters about 50 to 60 events a month—mostly corporate events but also weddings, debuts, and other parties—with an average income of P15,000 per party of 50 guests. Thanks to active Facebook, Multiply.com and Sulit.com.ph pages that Ronald himself manages, TNJ not only works events in Bulacan and Metro Manila but also goes as far as Pangasinan up north and Batangas down south for jobs. The Torreses have grown the business without spending a peso on advertising or taking a peso from lenders, banking instead on word of mouth from dozens of satisfied clients. Still, they did not expect TNJ to thrive like it has, with a current regular workforce of 20 and seasonal employees of up to 100, for times when they have to work four or more events a day. “Most of our customers would come from Norzagaray (his hometown), which is close to the location of our business,” says Ronaldo. Their early customers, he adds, included cement companies Lafarge and Holcim, which operate plants in Norzagaray. Ronald stopped being an OFW for good in 2010 when TNJ’s earnings were enough to support his family—he and Lisa have sons Ron, 11, and RJ, 10. Now Ronald takes charge of operations and staff training, drawing on his years of serving on Royal Caribbean cruises, while Lisa is the chief event planner. The couple credits Aling Nene for the success of the business—Mrs. Joaquin created most of the flavorful dishes TNJ’s customers have enjoyed and spread the word about over the last decade. Ronald also praises his father-in-law Eddie, who helped Lisa shepherd the business while he was still abroad, and makes it a point to regularly reward TNJ’s crew of cooks, waiters, and decorators with bonuses. “There are a lot of catering businesses here in Sta. Maria and their setups are almost the same, but the food always makes the difference,” says Lisa, underscoring her mom’s cooking and recipes. “Customers will also look for the right price that fits their budgets, and TNJ Catering gives them that and more.” A decade’s worth of success is proof of it. This story was originally published in the February 2013 issue of Entrepreneur magazine.